The South Sandwich Islands, in the far southern Atlantic Ocean, are often shrouded with thick cloud, making it difficult to view the region from space. Sometimes, however, the use of false-color imagery can be used to reveal events that would otherwise be obscured under cloud cover. 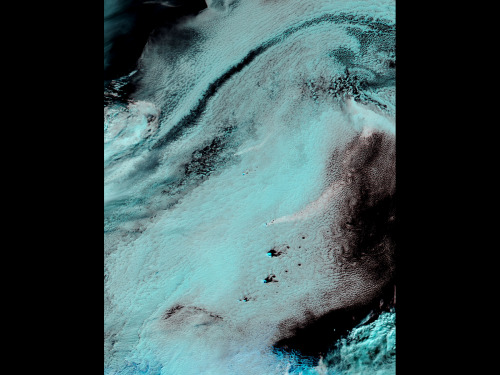 The Moderate Resolution Imaging Spectroradiometer (MODIS) aboard NASA's Aqua satellite flew over the South Sandwich Islands on April 19, 2014 and acquired this false-color image of the cloudy scene. This false-color image uses a combination of non-visible (middle infrared and infrared) and visible (red) light captured in bands 7, 2, and 1, respectively, to distinguish clouds from snow and ice. Here the ice-covered islands appear bright turquoise, the clouds light turquoise and the water in the ocean appears deep black. Because the volcanic plume is a moist mixture of gas and ash, it reflects all three forms of light relatively well, so it appears nearly white. In the north of this image, a thin plume of white rises from the volcano on Zavodovski island, the northernmost of the South Sandwich Islands and streams to the northeast. Further south, a wider white plume can be seen blowing across the Atlantic Ocean. This plume rises from the Mount Michael volcano, which is a young and frequently active stratovolcano located on Saunders Island, near the center of the South Sandwich Island chain. The white plume from Mount Michael forms a chain of swirling eddies as it blows to the northeast. To the south, similar eddies can be seen behind three other islands. These are known as Von Kármán vortices. These vortices can form nearly anywhere that fluid flow is disturbed by an object. Because the atmosphere behaves like a fluid, when streaming air hits a blunt object, such as a mountain peak, the wind is forced around the object. The disturbance in the flow of the wind propagates downstream in a double row of vortices that alternate their direction of rotation, much like the eddies seen behind a pier in a river as water rushes past.